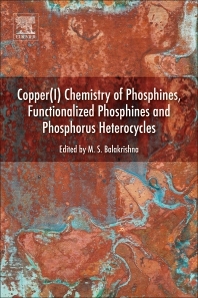 Copper(I) Complexes of Phosphines, Functionalized Phosphines and Phosphorus Heterocycles is a comprehensive guide to one of the most widely used and extensively studied metals: copper. The numerous practical applications of copper compounds are discussed, including homogeneous and heterogeneous catalysis and their use as fungicides, pesticides, pigments for paints, resins and glasses, and in high-temperature superconductors. The remarkable structural flexibility of simple copper(I) complexes, such as cuprous halides is covered, including numerous structural motifs that, when combined with different ligand systems, exhibit linear, trigonal planar or tetrahedral geometries. This work is an essential reference for inorganic and coordination chemists, as well as researchers working on catalysis, anticancer reagents, luminescence, fluorescence and photophysical aspects. Maravanji S. Balakrishna has been teaching inorganic chemistry since 1996 and currently is Professor at the Indian Institute of Technology Bombay. He has published more than 170 papers in international journals on phosphorus-based ligands and their metal complexes and various applications. His research interests include main group chemistry, coordination and organometallic chemistry of mono-, bis-, tris- and polyphosphines, and functionalized phosphines, homogeneous catalysis, and anticancer studies.